I'm not sure of the original source of this recipe (Mimi? Mom?) but in our family, it's Mimi's Special Lasagna. It's hearty, yet not overwhelmingly rich. It's sturdy while still having plenty of filling. In other words, it's delicious! I think it will probably take me just as long to type up the recipe as it did to make it. The recipe can be intimidating, so I usually do it in phases. Day One: make the 2 sauces & Day Two: assemble and bake or freeze to bake later. But on Saturday I made it all in one go (didn't know how long we would have power!) and only using 2 pots, 1 bowl and a baking dish, and it really didn't take that long. So it's doable! Maybe not as a weeknight meal (unless you prep in advance), but I'm happy to realize it doesn't have to be a 2 day process. Sauté above in olive oil until meat is no longer pink. I do this in our Le Creuset French Oven so everything can fit in one pot. 3 lbs canned tomatoes, drained, chopped -- I used whole, peeled tomatoes and crushed them with my hands. You could probably use canned crushed tomatoes (duh!) or diced to save a little time. Also reserve the juice in case you need it to thin out the sauce. 2 Tbs chopped parsley -- didn't have it, so I didn't use it. Added a few shakes of dried Italian seasoning instead. Cook all above until sauce is quite thick (30-40 minutes). Skim fat. At this point, this may be refrigerated until the next day. Combine the milk and chicken broth in a microwave safe container and microwave until steamy. Melt butter in a large skillet, add flour, and cook for 1 minute, stirring with a whisk. Slowly add warm milk and chicken broth and bring to a boil, still stirring with whisk until sauce coats the back of a spoon. Add salt if needed. Beat egg in a bowl, add remaining ingredients and stir well with a fork. 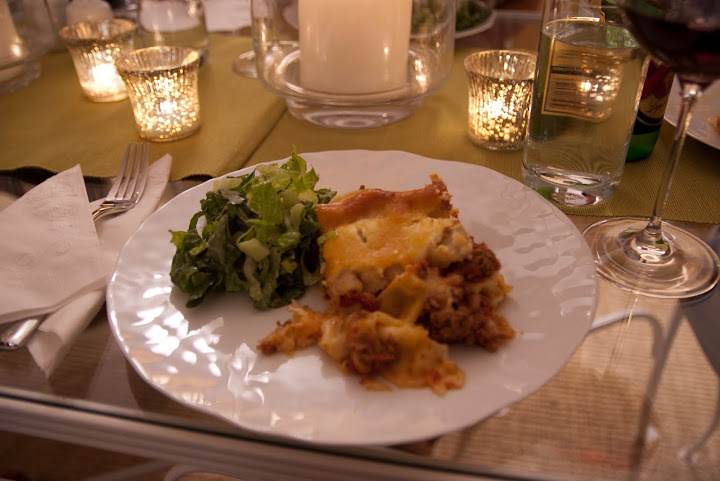 If using traditional lasagna noodles, cook noodles in boiling salted water until al dente. I use no-boil noodles. Maybe that helped with the easy prep! Just remember that no-boil noodles need a little more liquid so the lasagna doesn't dry out. I used some of the reserved tomato juice. If you're using no-boil noodles, pour in a little of the reserved tomato juice around the edges. Dot with butter (oops, I skipped doing this! Quite unlike me to leave out a step that involves butter, but it was still delicious!). At this point, the dish may be covered and refrigerated. It can also be divided into smaller portions and frozen. From room temperature, bake at 400° uncovered for 30 minutes.